Nothing magical or mystical about the polishing mixture. I just read the instructions that came with the Rottenstone I bought from Luthiers Mercantile and used those as a starting point. As I mentioned much earlier in the thread, these are the first instruments I've finished with shellac so I am learning as I go. The instructions basically pointed to using the Rottenstone with a mineral oil as a lubricant and applied with felt pads. There was also a recipe for a polish based on methanol that scared me (as that would soften the shellac) but was more directed at restoring old finishes. So I searched online, and found some more articles. Read through them, and then bit the bullet and came up with something that made sense to me. I took some Rottenstone, added a drop of washing up liquid as an antistatic/antisurficant and then added White Spirit (mineral oil) until it was the consistency of pancake batter. So, basically, I relied on existing knowledge and experience, did some reading, and came at it from 1st principles. It worked well, and there was nothing in the mix that could have done any harm. I needed to trim a little off the width of the nut, so I did. And then I applied a couple of tiny dots of glue to the bottom of the nut, put it in place with the strings on, and left it to dry. The nut is never permanently glued in place, just enough to stop it slipping and sliding and dropping off when you take the strings off. A neatly applied tap with a hammer will ease it off if needed. Then I watched the cricket and a vintage England batting collapse just as I was settling in for a commanding 2nd innings lead. Then it didn't take long to file the nut slots to final depth, take the saddle down to final height, shape the top of the saddle, polish it nicely, remove the excess from the nut and polish that too. And now it's looking and feeling good. I'm leaving it overnight for the strings to settle, but basically it's all done. The action is satisfactory, but I might take the nut slots a little lower tomorrow. But, essentially, this one is now finished !!!! zenguitar wrote: I've tried out a few chords and all sounds good.. essentially, this one is now finished !!!! Far out Andy As for the strings, I always think steel ones take three or four days, maybe a week to settle in to my ear. Nylon ones somewhat longer... You may disagree (if you don't keep us on the hook before you record it). Have you signed it yet? The back of the truss rod cover might be a discreet place. Has anyone done that? 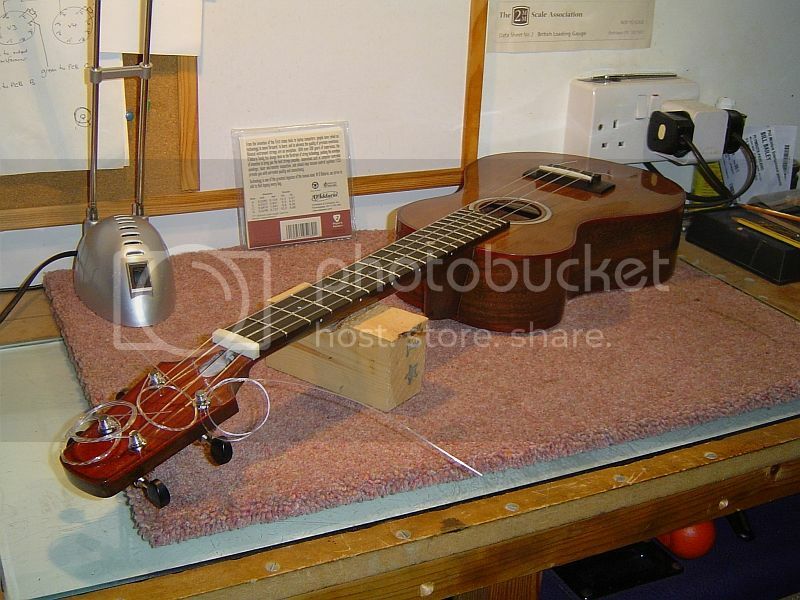 zenguitar wrote: And then I applied a couple of tiny dots of glue to the bottom of the nut, put it in place with the strings on, and left it to dry. Yep, deduced that bit long ago when I removed all the strings on my old cheapo archtop jazzbox and the bridge fell right off, and I had to line it back up using the outlines on the top left by glue reside. Nice to see project uke back in action! Can't wait to hear it! The strings are settling in nicely. But I might give them a fright tomorrow when I fine tune the nut, still need to take the 1st fret action down by 1/3rd of a millimetre. But that's just a matter of popping the strings out of the slots, running through them with the fret files again, and re-polishing the slots. I really must get around to making a label, but that can wait for now. When I do, it will probably be a piece of parchment lettered with Indian Ink and glued in place with hide glue. Anyway, by tomorrow I should be recovered from an accidental overdose of cayenne pepper in my chilli tonight. Trying to cook and watch the cricket at the same time. Note to self; pay attention in future. zenguitar wrote: I really must get around to making a label, but that can wait for now. When I do, it will probably be a piece of parchment lettered with Indian Ink and glued in place with hide glue. Jessie Hoff of Lazy J Projects told me he spent his last few quid having the labels for his amps knocked up when he built his first one and never expected to be asked to build another. Those were desperate days for him, which is on record. He only wanted a minimum number but had to order a batch of 100. Nearly broke his heart to part with the money because it pretty much broke him on the day. When he told me he'd just put one of them on my amp, which was number 75. And he was in the process of ordering another hundred. Never know, do yah! Parchment is probably a good way to go. Less stress and that has to be good for the ukes. 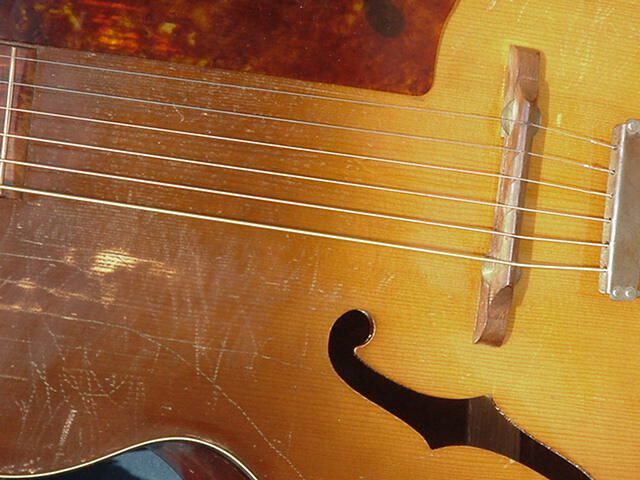 Well, I'd assumed the crud on the top below the "feet" of that archtop's bridge was some kind of glue residue but it might well just have been "crazing" of the top's finish rather than any glue, as it certainly didn't keep the bridge from popping off once the string tension was relaxed. Actually a better bridge imo than the tune-o-matic on ES-330/Casino hollowbodies. Has anyone ever mentioned that a ukulele is a [email]d@mned[/email] silly instrument? Far too small for proper fingers, and no relationship to guitar tuning!!! Who's idea was this anyway? At this rate I'll be making a truss rod cover rather than playing it. 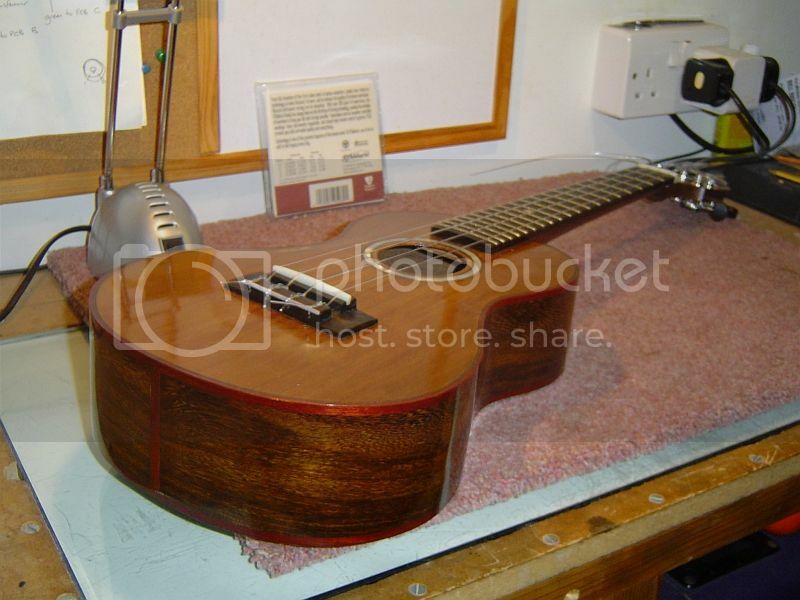 zenguitar wrote: At this rate I'll be making a truss rod cover rather than playing it. An inverted white 'U' with a pheasantwood veneer? By the way, do you normally have a logo on your handbuilt instruments? I won't argue about the damned silly instrument bit, but I did think that the tuning was effectively the top four strings of a guitar capoed at the 5th fret? dwebb wrote: I won't argue about the damned silly instrument bit, but I did think that the tuning was effectively the top four strings of a guitar capoed at the 5th fret? Yep, that's right. Which leaves us with G C E A. So you can play all your guitar chords on the Uke (minus the bottom two strings), only their names change. A D-Chord becomes a G-Chord, your average Cmaj (or Am7) turns into Fmaj (or Dm7) and so on. Takes a little getting used to, but otherwise as a guitarist you shouldn't have any problems playing the Uke. So far, no headstock logo. I might come up with one one day, although I like to use the headstock for inlay sometimes. And I think I have some ebony veneer lying around for the truss rod cover. But tradition dictates that I wait a few months minimum before making one. Thanks for that. It was the soap that intrigued me- I was picturing a bar of lifebuoy! D'oh! I've got a big jar of polishing powder and one of a polishing talc, which is finer. I've never thought of pre-mixing the powder though. I put some in a small dish, put some polishing oil on my cloth and then pick up some powder with that. it obviously goes to a paste staright away as you apply it. I do have a proprietary mixed polishing liquid called Super-nicko which is water based. Probably pretty similar to your mixture except for the water. I suspect that ther is something like soap in it too. The powder in that separates out when left for any time, but it reconstitutes easily enough. If I use the talc for a final final go I put it on neat. I have several cleaning concoctions too, gleaned from reading around. The simplest which I really like, and some times use with a bit of polishing powder, is eucalyptus oil and olive oil 50/50. Smells great! Not sure whether experts would approve of the organic as opposed to mineral oils though. I was about to offer to take the dear little thing off your hands, so helping you avoid the frustration of trying to play it with it's 'silly' tuning, only it dawned on me that I wouldn't know how to play it at all. What I think is that if Andy doesn't bond with the fruit of his blood, sweat and tears over the next few months we should all chip in so it can be gifted to a suitable trust... which between us we ought to be able to identify. Someone equipped to use it within a well conceived and executed educational project. And in my wildest imagination it should spend time at somewhere like Tate St Ives, where it can be seen and played, along with the entire Project Ukulele thread and interpretive media about the educational project. Just a thought. But only if Andy decides he just ain't going to get into the uke thing for himself. Project Ukulele has been a wonderful success and deserves to remain an inspiration in perpetuity. But yes, I MUST get around to making a recording soon. Just bear in mind that I am largely (but not entirely) dysfunctional AND I live in Devon. For those living in the UK with access to Sky Arts One: Tomorrow evening, Sunday 4th August at eight in the evening they are screening the excellent film 'the mighty uke'. Followers of this thread will most likely find it as enjoyable as inspirational.